You need to know a few things about the ancient Roman empire for the GED Social Studies test. Roman civilization built on classical Greece and the Hellenic empire of Alexander the Great. Romans conquered an empire that lasted more than 500 years, longer than any other western European empire. Including the Eastern Roman Empire, the Roman Empire lasted an amazing 1,500 years. Although Greek civilization left behind theater, arts, democratic government, and philosophy, the Roman heritage is more practical. Roman roads crossed Europe, providing the first safe and rapid communications network from Britain to Greece and Rome to Spain. The Romans were great administrators, creating a legal code that is the foundation of modern law, and proved to be talented engineers and builders. Roman law began with the Twelve Tablets, dating back to 449 BCE. These were written laws in the tradition of Greece and Babylon, defining legal rights and punishments, procedures, and duties. The laws were posted in the Roman forum for all to see. When the litigants settle their case by compromise, let the magistrate announce it. If they do not compromise, let them state each his own side of the case, in the comitium of the forum before noon. Afterwards let them talk it out together, while both are present. After noon, in case either party has failed to appear, let the magistrate pronounce judgment in favor of the one who is present. If both are present the trial may last until sunset but no later. One who has confessed a debt, or against whom judgment has been pronounced, shall have thirty days to pay it in. After that forcible seizure of his person is allowed. The creditor shall bring him before the magistrate. Unless he pays the amount of the judgment or someone in the presence of the magistrate interferes in his behalf as protector the creditor so shall take him home and fasten him in stocks or fetters. He shall fasten him with not less than fifteen pounds of weight or, if he chooses, with more. If the prisoner chooses, he may furnish his own food. If he does not, the creditor must give him a pound of meal daily; if he chooses he may give him more. On the third market day let them divide his body among them. If they cut more or less than each one’s share it shall be no crime. What was the Roman punishment for an unpaid debt? The debtor was certainly put in stocks, but not as a public humiliation, Choice (A). The Court did order repayment, but only allowed three days for payment to be made, Choice (B). There was no court-ordered regulated payment plan, Choice (C). If the debtor made no repayment within three days, the penalty was death, Choice (D); Tablet 3, paragraph 2 spells that out. The debt holders literally got their pound (or more) of flesh. Roman law developed to include both fixed written laws and common law, which is based on precedent and tradition. That structure allowed laws to evolve as attitudes changed. Roman culture also showed the beginnings of a division of laws into criminal and commercial; in the case of Rome, laws were divided between those that involved the state and those for individuals, which included criminal, contract, and civil law. They also had laws limiting terms in office for elected officials, laws regulating inheritance and debt, and even procedures for the right of appeal of death sentences. These laws, and a later collection of them called the Justinian Code, became the foundation of the European legal code. Most significantly, as trade recovered after the collapse of the Roman Empire, merchants discovered that Roman contract law was a far better tool than the tribal traditions they had inherited. Roman building skills were based on two life-changing inventions: the arch and concrete. The Romans took the concept of the arch and applied it in new ways. They used it to span large spaces without the need for pillars. Because the arch could support more weight than a flat ceiling, the Romans were able to build much larger structures. Egyptian and Greek temples needed pillars every few feet, but Romans were able to create bridges with large spans and buildings with large, unobstructed interior spaces. When arches are combined, they create a barrel vault, like the tunnel entrance to a theater in Pompeii. Rotating the arch around a common center creates a dome, something totally impossible before this innovation. 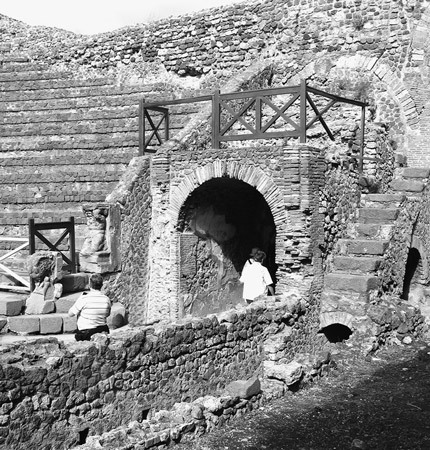 Tunnel entrance to a theater in Pompeii. Romans also improved on concrete, a vital building material. It was strong and lasted far better than modern concrete, as witnessed by the Roman structures still standing 2,000 years later. (Good luck saying that about your driveway in a few thousand years.) Combining arch technology and the ability to pour concrete into forms allowed Romans to build huge domed buildings like the Pantheon and the Coliseum. What is the significance of the arch in Roman architecture? (A) Romans created buildings with large open interior spaces. (B) They explain how the pyramids were built. (C) Arches were a fast way to build aqueducts and bridges. Choice (A) is the best answer based on the text. Choice (B) is wrong because the text mentions nothing about pyramids, and arches didn’t play a role in the architectural design or construction of the pyramids. Choice (C) may be partially correct but it’s not the best answer.